Fast forward to my impending old age and a very different sort of moratorium reared its head in a very ugly way in December of 2011. An obscure body called the National Science Advisory Board for Biosecurity (NSABB) called for censoring two pending publications on genetic changes that can lead to bird flu viruses gaining the ability to pass from person to person. As I documented in a series of posts on this issue, NSABB’s action was nothing more than security theater. Of special relevance is the fact that two sets of experiments were under consideration. Only one set of work involved the intentional splicing of genes to produce the new virus while the second set of researchers instead produced the new virus by repeatedly infecting ferrets, which were used as a stand-in for humans. In other words, NSABB was advocating for not publishing DNA sequences of the new viruses because they could be used by terrorists to produce a bird flu bioweapon when one of the viruses had been generated using a method that had zero reliance on knowing the DNA sequences involved. Fortunately, the DNA sequences were eventually published in full, but the last time I checked, the NSABB was still interfering in follow-up work in the US, continuing its dedication to terror theater. Playing somewhat into the NSABB’s security theater is an extended video Laurie Garrett posted yesterday at the website for the Council on Foreign Relations. I’m usually a huge fan of Garrett’s work, having relied on her especially during the emergence of the H7N9 virus in China. In the video, however, Garrett shows a high level of concern over the fact that there are now 3D printers capable of “printing” DNA. Garrett fears that this leap forward in technology, especially if it achieves the very low cost that is projected, may enable very small, poorly funded groups to “print” biological weapons capable of unprecedented levels of devastation. I find this concern to be overblown. First of all, one need not rely on engineered organisms or new combinations of genes to arrive at a formidable bioweapon. Further, the concept of low cost production of bioweapons has already been researched very fully by the Defense Threat Reduction Agency in its Project Bacus. [That I suspect the Project Bacus facility to have been the real site of production of the anthrax spores used in the 2001 anthrax attacks is an entirely separate concept.] In other words, DNA printing doesn’t really add to the already existing risk that some dangerous biological agents can be produced and released by individuals working with very little financial or government support. Second, the prospect of printing an organism is still a bit off in the future. 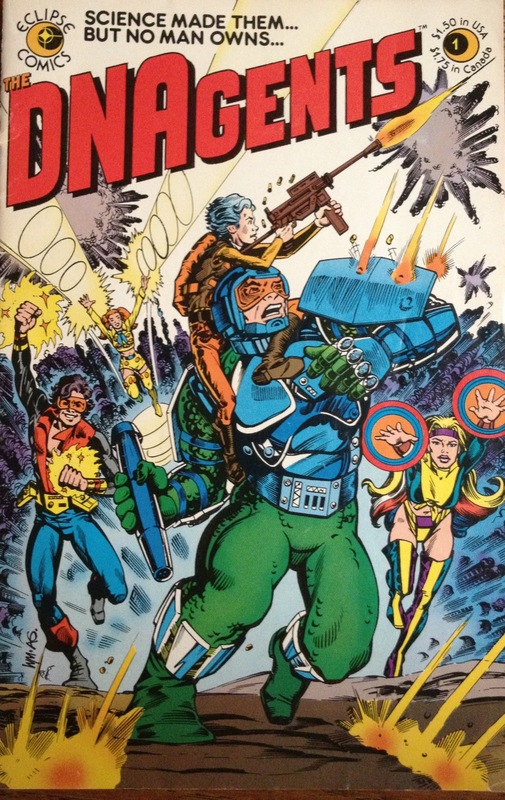 It is about as advanced as the comic book cover above, where a group of superheros called the DNAgents were synthesized in the laboratory using methods that were projected in 1983. I suspect that society will survive this latest scientific breakthrough. We still stand at risk of naturally occurring bioweapons like the Spanish flu outbreak in 1918 or whatever weapons bad guys choose to toss our way, but I just don’t see DNA printing as changing the risk levels all that much.